Welcome to Elk Lodge in the Smoky Mountains! 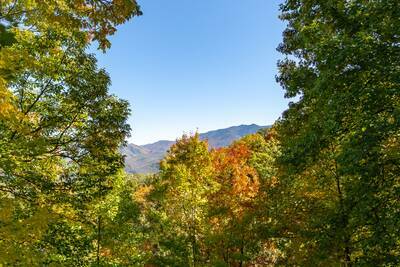 This 5 bedroom, 5 bath cabin rental accommodates up to 18 people in total comfort and luxury. The moment you step into this astonishing vacation cabin, you are surrounded by marvelous decor and the beautiful warm tones of the gleaming natural wood interior. The charming main level living room features comfy seating, TV and a marvelous stone accented fireplace. Adjoining the living area is the fully equipped kitchen. Prepare, cook and serve a mouthwatering dinner, savory lunch or delicious breakfast from the comfort of your Smoky Mountain cabin rental. Also located on the main level of Elk Lodge are two super comfortable and relaxing king bedroom suites. Both feature TVs, custom log beds and their very own private in-suite full baths (one of them has a jetted tub). Take a walk upstairs and you’ll enter the astonishing second floor living area. Here you can take in the mountain view from the large picture windows. Sit back and relax while watching TV on one of the sofas or head over to the game room for some really fun and exciting times. In the gaming area, you’ll be able to keep everyone smiling and entertained with your very own air hockey and foosball tables. Jump in and play a game or sit back and watch the competition unfold. Upstairs you will also find two additional luxury king bed suites with log beds, TVs and attached private baths for added convenience. On the lower level of Elk Lodge is an exhilarating pool table game room. Gather round with all your friends and family and play in your very own entertaining pool tournament. The game room also features a pub table and wet bar with mini fridge. Just off of the game room is the wonderful media room. Here’s where you and your guests can prop your feet up and watch your favorite sports teams, movies or TV shows on the big screen. 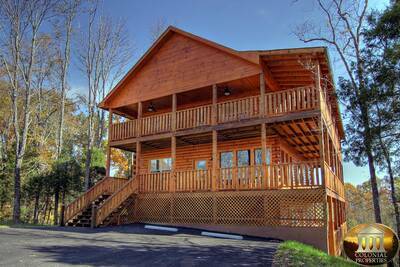 Elk Lodge cabin rental features 3 levels of incredible covered wrap around decks. 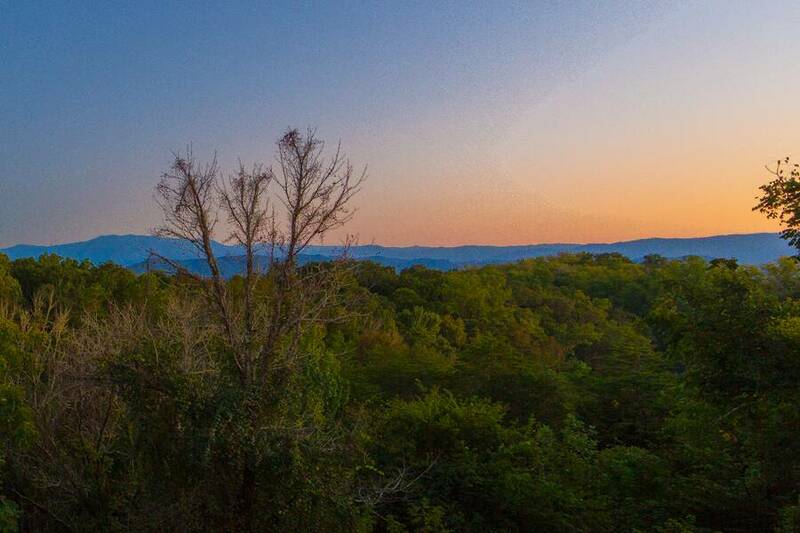 This amazing cabin has wonderful outdoor space for everyone in your party to experience the tranquil and serene beauty of the Great Smoky Mountains. Sip your morning coffee in one of the comfy rocking chairs, admire the beautiful view or take a dip in the bubbling outdoor hot tub. With 4 luxurious king bedrooms, 3 living rooms, 2 game rooms, a media room and astonishing views of the Smokies, your stay at Elk Lodge is sure to put a smile on everyone’s face and provide you with an incredible vacation cabin where you can enjoy all of the attractions, sights and beauty of Pigeon Forge and Gatlinburg. Plan the ultimate getaway today at Elk Lodge! A: This resort does not have pool access. A: Hi Maria. This property is pet friendly but only up to 25 lbs. / 2 dog limit. A: Hi Pamela, I apologize, it is not handicap accessible. A: Hi Katie! Any person 2 years of age and older is counted in the occupancy. A: Yes, there is a 2 pet maximum, and there is a 25 pound limit for each pet. A: Yes, Elk Lodge has a Charcoal Grill. A: Hello Lisa, Elk Lodge is pet friendly and allows 2 small dogs, please call our office at 1.800.371.0341 for a list of pet friendly units with no restrictions. A: Elk Lodge is located in Sevierville, the drive to the aquarium will be approximately 30 minutes. A: Hi Harry! Elk Lodge is a 5 bedroom 5 Bath that sleeps 16. This property is dog friendly. A: Hi Steve! The roads to Elk Lodge are great and paved all the way to the cabin. A: Hi Emily! You can snowboard at Ober Gatlinburg. A: Hi Jane! This cabin has a standard coffee pot. “ It was a nice place to stay. The people at check-in were very nice to my family and I; willing to help and take time to look for what we where looking for. We will use them again if we go back to the Smokies. “ Absolutely breathtaking cabin with beautiful views and plenty of room! We will definitely be back to stay in this cabin again next year! “ This weekend was a great weekend. We spent time with family from North Carolina and we are from Ohio What a place to meet - Elk Lodge. Our cabin was very clean and perfect to get 4 families together for a long weekend. The sad part of the weekend was we had to leave and go back to our homes. We are talking about meeting next year again and what a perfect place to meet will be at Elk Logde. Thanks to everyone at Colonial Properties for their effort in making our stay enjoyable and memorable. A great big Thanks to Megan for all your help. “ Prices were great, we stopped looking as soon as we saw your website. We look forward to booking with you again soon. “ This cabin is great and spacious! The pool table and hot tub are fabulous! This was a nice cabin and only 15 minutes from the outlet stores in Sevierville. “ Had a wonderful time in the cabin, we had four teenagers and they really enjoyed all the games provided. (Pool table, air hockey,etc.) The decor was beautiful and the beds comfy. The view was good also. Would definitely recommend this one. “ The cabin was amazing. Very Spacious and accommodated our needs. Would definitely book one of your cabins again. “ The cabin was beautiful and very roomy. It's an annual visit we do as a family. It offers privacy and togetherness all in one. “ Location was very nice for us. We spent a lot of time at the lodge. Grocery store close without all the traffic. “ Elk Lodge is a beautiful cabin, with everything a person could ask for in amenities. It really did have something for everyone. I personally loved the covered decks and the beautiful views from the rocking chair I staked out for myself. The younger bunch loved playing pool, Foosball, and air hockey in the evenings! We had an awesome vacation, in an awesome cabin! “ From the moment we entered the cabin we found ourselves at home. This is a beautiful cabin with awesome views. It’s close to the main attractions but far away enough to get some peace and quiet. Personally this has been the most relaxing vacation I have had in years. My wife had to convince me about going to the mountains in January, especially since we were coming from Florida, but I left wanting to return again during the winter. The staff at Colonial did an awesome job, starting from the reservation process and answering questions and all thru our departure. All I can say is we will be back! “ These cabins are outstanding. With the size of these cabins for these prices, you can't pass them up. They are clean and wonderful. I hope to be able to stay at one of these cabins again. “ Very spacious cabin. With three separate living rooms it makes for a nice family gathering. “ Great experience. Awesome place. Very clean. “ Beautiful place and breathtaking views. Very large and plenty of room for our entire family! “ The Elk Lodge was the perfect cabin for our trip to Sevierville and the Women of Joy Conference. Everyone in our group loved it and the location to the Convention Center was excellent. We will definitely be staying with Colonial Properties next year and depending on the size of our group, just may stay again at the Elk Lodge. Everyone was THAT impressed!! “ All the cabins are beautiful, the view was wonderful, and the size is magnificent. “ Our stay was absolutely amazing, and we had a fantastic time! “ Our family of 14 truly enjoyed our vaca in your cabin. My kids and grandkids had the best time plying pool and air hockey. Also got pics of the deer in the back yard! Thanks so much! “ Overall, the staff, when I called, were extremely friendly and took the time to suggest different shows and places to visit(and I called many times to ask questions). Along with the Manager, Michelle, who went out of her way to please us when we had a small issue. I will recommend this company to friends and family. Also, would use them again. “ Elk Lodge is a cozy cabin to stay in. The Foosball, air hockey, and pool tables were great to have for the kids and adults. We snuggled up on the sofas in the movie room to watch a movie. The four bedrooms ALL with King size beds were wonderful. No fighting between the adults of who gets the bigger beds! And, of course, the hot tub was a huge hit with my family. Thank you for letting us stay in your beautiful cabin. We didn't want to leave, and will definitely be back. “ The cabin was more than what we expected. It was very cozy, comfortable, and had an amazing view. We didn't feel like ending our vacation at all. We will definitely come back here. “ First of all, it was way more than expected; very clean, quiet, spacious, and also affordable. I do believe when we return, this will be our home away from home (lol). My only regret is that we didn't get to stay long enough. “ Overall experience was great! Cabin was absolutely breathtaking, view was even better. Very roomy and big enough for our family vacation. Thank you this place is gorgeous! “ We had a great time. The cabin was clean and very spacious. “ The over all experience was wonderful, Cabin was clean and well equipped. Everyone had a great time. May never stay in a hotel again. “ The Elk Lodge cabin was absolutely perfect for our family get-together. Three floors worked great! The kids had the game room, older kids had the big screen TV, and us older folks enjoyed the rocking chairs on the porch! Thanks again for the memories!! “ We brought some of our youth group down for a trip to Dollywood/Splash Country and we had a blast, the cabin was awesome, very roomy, and clean. I also liked how convenient it was to get to the parks and town yet we were out far enough to not feel like we were in the middle of the town and crowd, the beds were comfortable and I cant wait to go back again and will definitely go with this company again! “ The view was awesome, the privacy renewed our senses, and the decor made us feel at home. Wonderful trip! “ The property was more than we expected and well equipped. The view was wonderful and the location was easy to get to and also secluded. Would recommend this property to family and friends. We expect to revisit the property ourselves. “ Cabin was the perfect size & layout for our family get together. It was great to have our entire family together in one place for our 50th anniversary. “ Eight family members met for a reunion. The cabin was very spacious. We loved having (5) bathrooms, enough for everyone. The quietness and privacy was great. It was a great week together and we had a great time watching the big screen T.V., playing pool and air hockey. We will definitely return again and would like to try out other cabins. Check in was great and the staff was very friendly. “ Very nice cabin. Pefect fit for multiple families under one roof. 5 bathrooms were a great plus. Easy access to attractions by using Veterans Blvd.